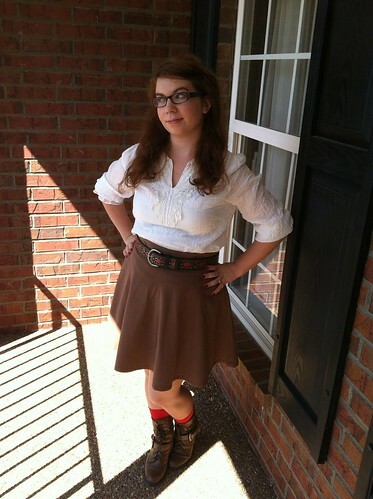 The best way I can describe this outfit: I look like the librarian from The Mummy. Or Indiana Jones’ kid sister. In either case, I am the most awkward picture taker ever. I need to branch out with some new poses. I’m going to make this my goal. I’m going to do all the cliche fashion blogger poses just so I can get myself to stop posing with my hands on my hips. Also, somehow I managed to stand in the only shaded part of the porch. Not only am I bad at taking pictures, I’m really good at being bad at taking pictures. I got mad skillz, yo. This blouse isn’t my usual style- it’s sheer and kind of frou-frou-y and stuff- but I really like it. It has kind of a ’70s vibe, which isn’t really me, so I played around with it and ended up in this historical-adventurer sort of outfit. And I really liked it. Even though the socks turned my feet violently red. Like, seriously. It was like I had stepped in tomatoes. I wore this for the first day of Narnia rehearsals with my students! This is my first full-length play that I’ve directed all on my lonesome, but I’ve got a fantastic cast and crew of kids who are really dying to work hard and learn a lot. Today I worked just with the kids playing the Pevensies, and I’m so excited so far. this is going to be a fun show, I just know it. I also started nonverbal improv with my theatre arts students. Today was all about communicating and reacting without saying anything, so we played two games- the floor is lava, and air traffic controller. For the first one, I picked two students to be the “movers”- they were immune to the lava and could move furniture around to help their classmates across (although on the second go-round, I told them they weren’t allowed to use any of the metal chairs, making them have to get creative). For air traffic controller, I blindfolded one student (the “airplane”) and assigned them a student to guide them (the “air traffic controller”). The other students rearranged the furniture and added themselves as obstacles, and the controller had to direct the airplane across the room. It was so much fun! Especially when I put a rule in place to keep them from talking. Each student has a labeled bag of M&Ms, and every time they talk, I get to eat an M&M. At the end of the week, when we’re done with nonverbal improv, they get whatever candy is left. It’s a win-win situation! They’re quiet, and I get chocolate! And also, my hair did not last like that for very long. Before my theatre arts class even started I had braided it all back. Too hot for fluffy long hair!